Although Fortaleza may be a relatively isolated coastal city, it is huge and one of the largest in Brazil, being the proud capital of Ceará. As well as being an important economic hub, Fortaleza is also known for its excellent tourism opportunities, boasting numerous splendid beaches, an alluring nightlife and a heaving off-season carnival each July. Much history is present within the Centro area of Fortaleza, although it is understandably the beaches that serve as the biggest magnet for tourists. The Praia de Iracema is a very lively part of the city, and although the beachfront here is virtually non-existent, the nightlife scene is excellent. Close by, the Praia do Meireles is a very popular beach offering some of the best accommodation available. The port of Mucuripe comes next, followed by the Praia do Futuro (Futuro Beach), which all would agree is the principal beachfront. Municipal tourist kiosks and offices are widespread in Fortaleza, being provided by the Ceará tourism organisation and offering the latest in regional tourist information. 'Setfor' and 'Setur' outlets reside within the Centro district (on the Praca da Ferreira and the Rua Senador Pompeu) and in Meireles (on the Avenida Beira Mar), with further kiosks being located at the Mercado Central, the bus station and Pinto Martins Airport. Many of the biggest attractions in Fortaleza relate directly to its innumerable beaches, generous coastline and plentiful sunshine, with beach buggy tours being popular with holiday makers. Tourists who enjoy the water sports presented by the Atlantic Ocean may like to consider trying a spot of kitesurfing or windsurfing around the Praia do Futuro, or if you are a novice surfer, then the surfing lessons available at Meireles may well suit. Leisurely boat trips, catamarans and schooner cruises provide a relaxing way to explore the coast and various packages are available, with some offering refreshments along the way and stopping at strategic, well-chosen spots so that passengers can enjoy a quick swim. In nearby Aquiraz, just a short bus ride away, the Beach Park Fortaleza is a major tourist magnet, featuring swimming pools, wave pools and more water slides that you could ever wish for. The Parque Ecologico do Rio Cocó (Ecological Park of the Coco River) forms an important recreational space, while soccer fans may be fortunate to catch a football match at the giant Estádio Plácido Aderaldo Castelo - a host stadium of the FIFA World Cup in 2014. More information about Fortaleza Tourist Attractions. Fortaleza was officially founded in 1726 and its oldest remaining buildings have been well cared far. The Forte de Nossa Senhora da Assuncao (Fortress of Our Lady of the Assumption) is one of the city's most historical landmarks and actually dates back even further, being built by the Dutch more than 350 years ago, before subsequently being taken over by the Portuguese. Other important historical buildings include the late 18th-century Palacio da Luz (Palace of Light), which once served as the headquarters for the government of Ceará. Slightly more youthful is the Igreja da Sé Catedral - one of Brazil's largest cathedrals, with a grand Gothic-Roman facade and a cavernous interior. For evening entertainment in Fortaleza, the Teatro José de Alencar (José de Alencar Theatre) offers a taste of culture and pleasant landscaped gardens. More information about Fortaleza Landmarks and Monuments. Even though Fortaleza functions as a major tourist resort, it does boast a number of very commendable museums. The Museu do Ceará (Ceará Museum) is one of the more interesting and comes with a sizeable collection of archeological treasures and ancient fossils. A visit to the Mucuripe Lighthouse will reveal the Museu Histórico de Fortaleza (History Museum) and its information relating to the earliest settlers in this region. Car enthusiasts will certainly enjoy spending an hour or two checking out the vintage vehicles at the Museu do Automovel (Automobile Museum), which is conveniently within walking distance of the Shopping Iguatemi mall. If you prefer art galleries, then the Museu de Arte e Cultura Popular (Museum of Art and Popular Culture) and the Centro Dragao do Mar de Arte e Cultura (Dragao Mar Centre of Art and Culture) should feature on your itinerary. More information about Fortaleza Museums and Fortaleza Art Galleries. All along the neighbouring Ceará coast are charming fishing villages, tropical beaches and rolling sand dunes, perfect for an excursion or two. There are more beaches close to Fortaleza than most holiday makers could dream of, and a choice of tour operators is on hand should you required an organised day trip. The south-easterly beaches of the Costa Sol Nascente (Sunrise Coast) are particularly special and easy to find. Although the nearby fishing village of Canoa Quebrada may be small, its beachfront, buggy rides, windsurfing opportunities, traditional 'jangada' sailing boats and nightlife all combine to create quite a draw card. Also worth considering whilst in Fortaleza are excursions to the Brazilian villages, towns, cities and resorts of Cumbuco, Fontainha, Guajiru, Lagoinha, Ponta Grossa, Quixaba, Redondas and Retirinho, as well as Jericoacoara, which has become something of a Mecca for hippies, due to its laid-back vibe and relaxed pace of life. 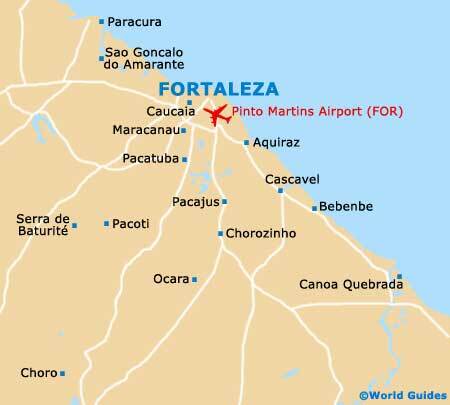 More information about Fortaleza Attractions Nearby.